Description: Magazine W.E. Harrison, Ipswich, 1931. First Edition, Paper Covers. Very Good/N/A.. 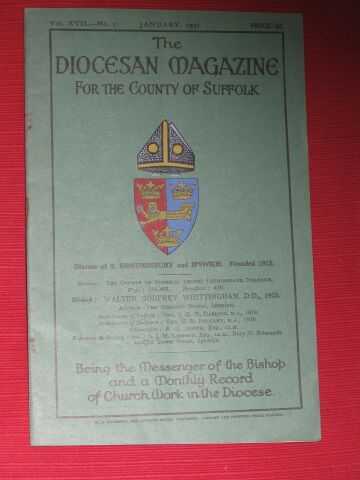 Being the Messenger of the Bishop and a Monthly Record of Church Work in the Diocese of St. Edmundsbury & Ipswich founded 1913; some rusting of staple; including adverts - 24 pages. Size: 8vo - over 7¾" - 9¾" tall. Item Type: Magazine. Quantity Available: 1. Category: Religion & Theology; East Anglia; Christianity; Bury St. Edmunds/Ipswich; Religion & Theology. Pictures of this item not already displayed here available upon request. Inventory No: THG00018.